Expands Half-Moon mill by adding a tavern, apothecary, fishery, and stable and an underground vampire den. Adds 12 unique NPC vampires. InsanitySorrow provided the Chessboard in the Inn and the room divider in the Apothecary. Oaristys made the awesome Alchemy Jars in the Apothecary shop. Blary created the Scale and the Moth Display in the Apothecary shop. Stoverjm made the static book on the bottom floor of the storehouse. Scroll down to the Updates section to find out what's changed with this version! 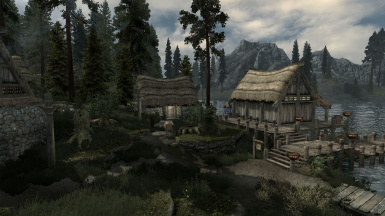 This mod adds new buildings, interiors, and NPCs to Half-Moon mill in an effort to make it appear more lively. The Vampires of Half-Moon mill try to mesh with human culture as much as possible. They'd hate to attract the attention of the Jarl of Falkreath or, Divines forbid, the Dawnguard. For that reason you won't see a lot of Vampire related things in their homes. Instead they work and live as normally as possibly. 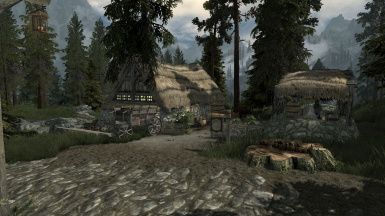 The New Moon Inn is run by a nord woman named Svelka. She employs Vincent as a bard and Fleurette as a serving girl. 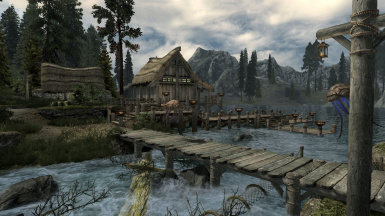 Secunda Stables is run by Tharviir. 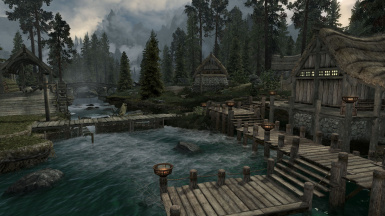 He's in charge of handling shipments of wood and fish to the different holds across Skyrim. His horses are important to his work, so he's not interested in selling them. Razir is a Redguard who came to the town with his friends K'reever and Plutius. He now patrols the town and deals with any threats that show themselves. K'reever is a Khajiit that guards the storehouse with his Imperial friend, Plutius. They make sure that no one steals the town supplies...or discovers the secret hidden in the basement. 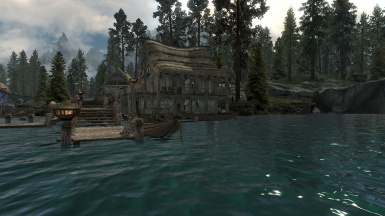 The Fishery is run by the Argonians, Veersha and Kerkivus. Their son Deerthus does chores around the docks and spends his evenings in the Inn with his girlfriend Fleurette. This mod requires all three Official DLCs in order to run. So Dawnguard, Hearthfire, and Dragonborn. There will not be a non-DLC version. These Mods aren't required, but they do add to the look and feel of the Vampire Cave and the Town itself. 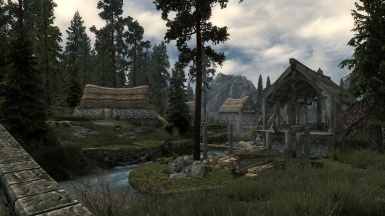 This mod drastically edits a number of cells around Half-Moon Mill. It adds a number of buildings and alters the landscape quite a bit in some areas. Because of this it is inherently incompatible with any mod that edits those same cells. I've tested this mod with Tel Nalta and everything works perfectly. This mod is currently in its Beta release. It's almost complete, but there are a few missing features and bugs. I would appreciate it if you share any bugs you find so I can try to fix them. The following bugs are ones that I'm aware of and will be working on (unless otherwise noted). * K'reever and Plutius sometimes glitch between floors in the Storehouse. They also have issues pathing to the first floor once Combat starts. 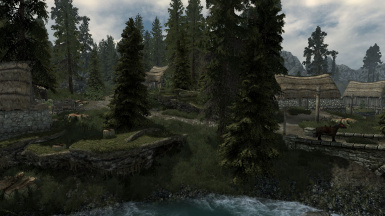 * Chopping wood for Hert raises the Player's relationship with the HalfMoonMill Faction. This means that everyone in town likes them more and it is no longer stealing to completely clear the shelves in the apothecary or the fishery. * Stealing on of the horses causes the other horse to attack you. This triggers the other NPCs to become hostile to you. * Plutius and K'reever automatically/randomly equip the best armor for their current level. This might cause them to equip weapons/armor they shouldn't have access to (dragon bone or daedric equipment). * The Fishery is "supposed" to lock during the day and unlock at night. This works intermittently and sometimes only one door or the other will unlock. * If you're loading an old save there's a chance that the NPCs won't use their updated schedules. This causes Orpheus in particular to stand around outside when he should be inside sleeping. These are the features that still have yet to be implemented into the mod. Once these are done, the mod will be considered out of Beta. * Chance to Contract Sanguinare Vampiris when Sleeping in the Inn? This mod would not be possible without the following resources from these Amazing mod makers.